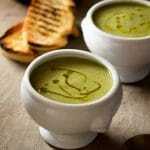 Zucchini potato soup simply made with zucchini, potato, garlic, onion and chicken stock it’s comforting, warm and creamy. 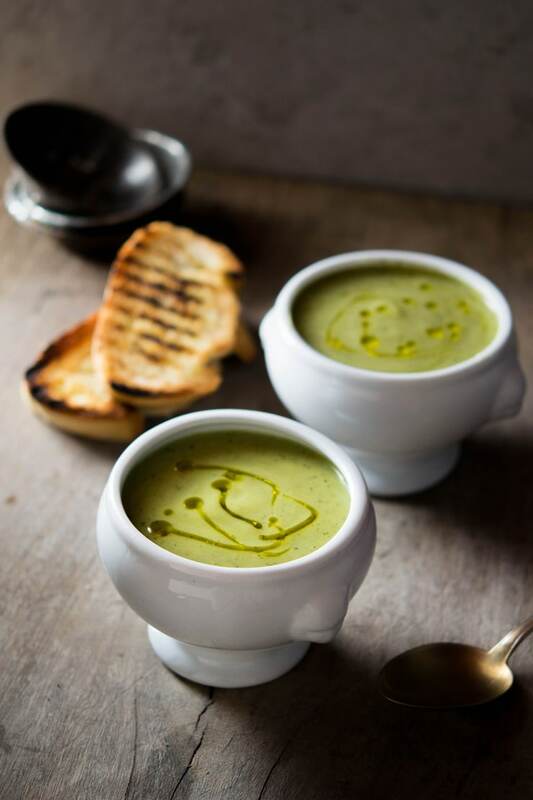 This zucchini potato soup is one of my quick, easy and healthy lunches that I love to make. It’s also great for dinner with some crusty bread for dunking. 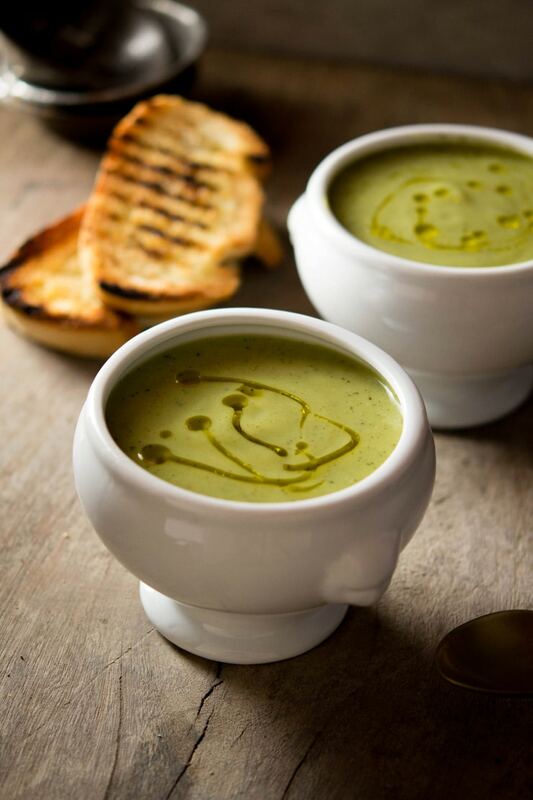 You won’t believe how much flavour is packed in this soup with just a few simple ingredients. I first tasted this soup years ago when I was volunteering around Italy. We were working on farms, picking olives, cooking, cleaning, painting whatever we could do to live in and experience Italy. Although it was a great experience we were sometimes left in awkward situations as you had to eat whatever your host family was cooking. One family we stayed with (not Italians) were massive meat eaters, I like meat and I have always eaten it, I had never thought about how much meat I ate before until I stayed here. Meat, pork, in particular, was served at every single meal and let me just say it put me off it for a long time. One time we went out to a restaurant in the local village and it was my chance to cram as many vegetables into my mouth as possible. I ordered zucchini potato soup and OMG it tasted like heaven, creamy (without cream), silky smooth and mouth-wateringly delicious. Soup had always been one of those things I found slightly boring, I could take it or leave it but eating this soup, this soup felt like I was in heaven on earth. After the volunteering ended and I could cook for myself, I decided to recreate the best zucchini potato soup I had ever tasted and I think I’ve got it pretty close. This is still one of my favourites for the fact it’s simple, healthy, easy and delicious….plus it’s pork free! FYI I do eat pork now there was only so long I could go without prosciutto, salami, pancetta and BACON! I just had to recover and get back to normal quantities. This soup is great for a relaxed weekend lunch or cozy dinner when it’s chilly out (not long now). I hope you enjoy it as much as I do! Finely chop the onion and garlic. In a large pot add the olive oil and sauté the onion until translucent, add the garlic and continue to sauté for 1 minute. Meanwhile slice the ends off the zucchini and coarsely grate them using a box grater. Add the zucchini to the pot and stir to combine with the onions and garlic. Peel the potato and cut into medium sized cubes, add to the pot with the zucchini and onions then add the chicken stock. Bring to a boil then turn down to a simmer for 20 minutes or until the potato is cooked through. 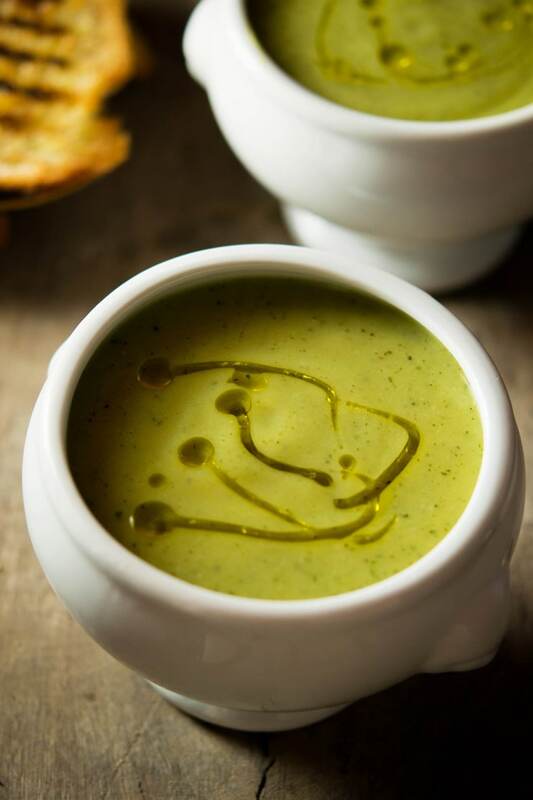 Remove from the heat, using a hand held blender blend the soup until thick and smooth with no lumps. Season with a pinch of salt and pepper, add the parmesan and stir until melted. Serve warm. Hi, by weight, how much did y’all zucchinis, potato and onion weigh, individually of course, before processing; or perhaps, how many cups full of stuff did it measure out to be. Thanks. This sounds exactly what we had to eat in a restaurant two nights ago, an trying to recreate it! Hi Bernadette! Sorry, I’m a little late in getting back to you. I didn’t weigh the vegetables for this recipe. I always use 4 medium sized zucchini to 1 potato. The potato is what gives the soup a thick and creamy texture so 1 medium to large sized potato is all it needs. I have made this soup serval times and it always turns out really delicious. Hope you enjoy it! I absolutely want to try this soup. I’ve been told it’s like a broccoli cheddar soup without the broccoli or the cheddar. I love this kind of texture which is thick and creamy. This sounds amazing, and anything that can give me that creamy mouthfeel without cream is a WINNER in my book! Isn’t it amazing how simple ingredients can just be down right incredible. This soup look like perfection to me. I know, simple food is always my favourite. Thanks so much Kristen. This IS my perfect dinner with some crusty bread, loving your recipe. Simply delicious.